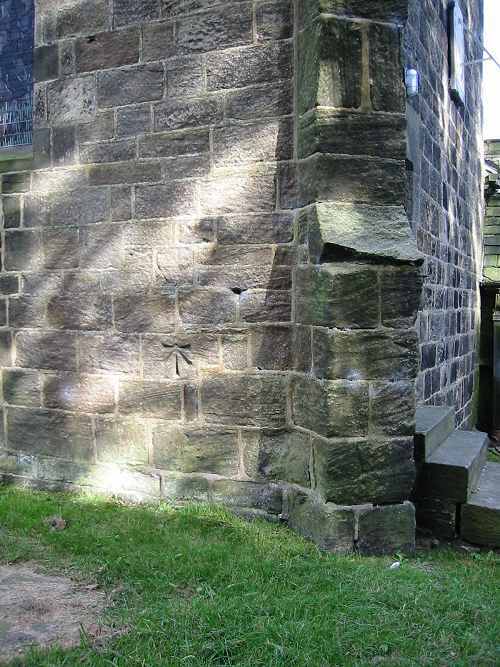 The oldest part of the present church which is the lower part of the tower, date back to the 15th century. The Church that we see today was not as the Brontes knew it. In 1879 the Reverend Wade, Patrick Brontes successor had the old church demolished leaving just the tower. You can see the outline of the double-gabled roof of the old church on the picture right. Its foundation stone was laid on Christmas Day, 1879, and it was consecrated on 22nd February, 1881, by Bishop Ryan. 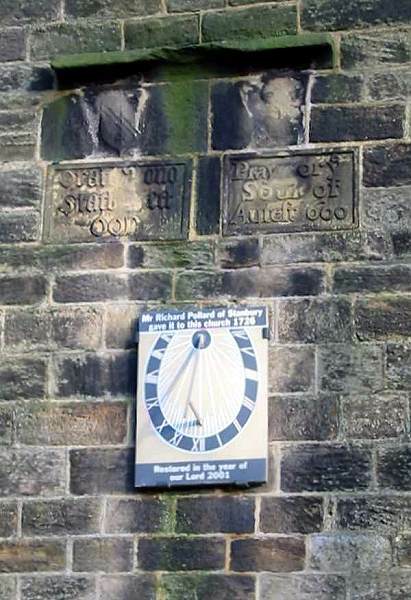 Richard Pollard of Stanbury gave the sundial to the church in 1726. It was restored in 2001. There is an ordnance survey mark on the S.W. corner of the church tower. The height is 796.1 feet above sea level. His grave lying at the base of the sundial. 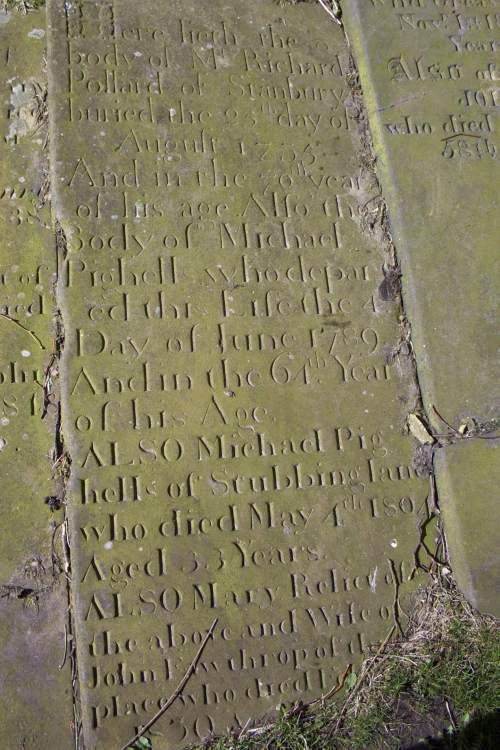 "Here Lieth the body of Mr Richard Pollard of Stanbury buried the 25th day of August 1735 and in the 70th year of his age." 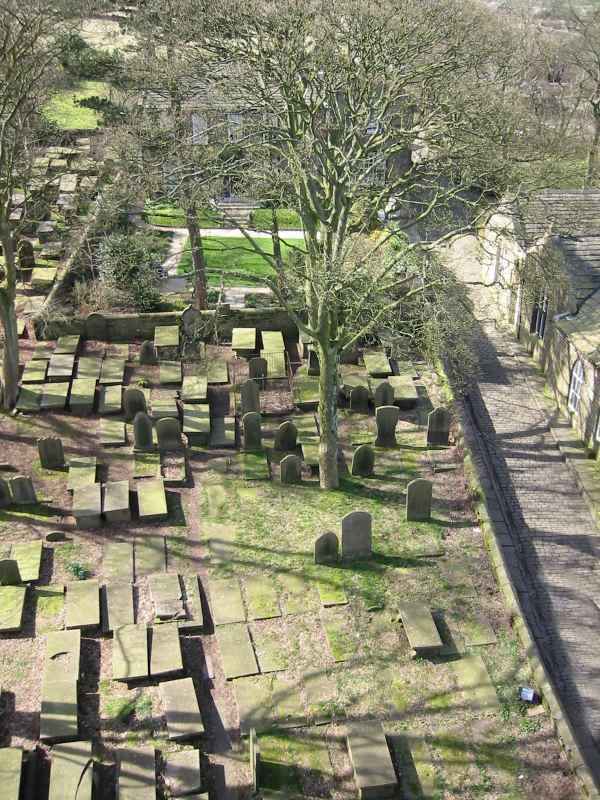 It is estimated that 40,000 people are buried in the churchyard, the burial registers go back to 1645. 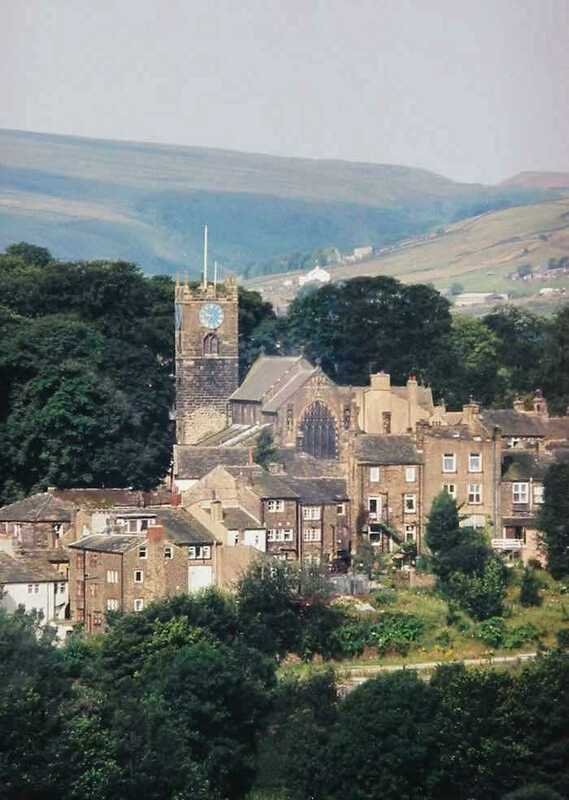 In 1849 the graveyard being overcrowded and badly drained was affecting the already poor sanitation in Haworth, Patrick Bronte requested that improvements be made regarding sanitation. Benjamin Herschel Babbage (son of Charles Babbage the Mathematician) visited Haworth and recorded the facilities for the General Board of Health. His report published in 1850 described the sanitation as being poor to the public health, with inadequate fresh water facility. It stated that 41.6% of children in Haworth died before the age of 6, average life expectancy was 24. The diaries from the school history are testament to the poor health of the children; smallpox, measles, whooping cough, scarlet fever are mentioned frequently as are the deaths of the children. There were 69 privies in the whole village, one to every 4½ houses. Some people drank from water contaminated from open drains. Many of the houses were damp due to backing on to higher ground that was continually seeping water from higher up. There were many cases of typhus, dysentery, smallpox and consumption. Babbage requested that gravestones were not to be laid flat on the ground as they were limiting the growth of shrubs which would help with decomposition. The trees were planted in the 1860's. 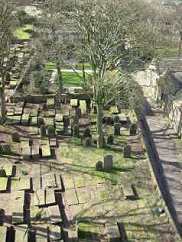 The Brontes are buried in a vault inside the church , except Anne who was buried at Scarborough.